Whale Watching from Your Ocean Front Patio! Experience all of the comfort and relaxation of Mexico, without all of the congestion. Our casita guesthouse is perfect. This beautiful, breathtaking Pacific Ocean beachfront property comes complete with large shady Mexican palapas, fully furnished, lush native landscaping and numerous relaxing terraces, with magnificent views of the ocean and Sierra La Laguna mountains. There are two homes, the Casa and Casita, both designed and decorated with modern and traditional Mexican themes rich in color with tiles and accents and beautifully furnished. A tall privacy wall surrounds the one acre property and whale watching from this oceanfront property is unsurpassed.There are roof-top terraces, with hammocks, 4 indoor and outdoor dining areas and a huge outdoor living room palapa. The secluded beach is perfect for long walks with chairs and umbrellas provided surf side. The largest surfing beach, Los Cerritos is just minutes away. Private massages are available as well as hiking, fishing and other excursions. A large book and DVD library is available. Night stargazing is at it's best here and there is a great outdoor fire pit to keep you warm. The interesting town of Todos Santos is just 15 minutes away, you have access to a beautiful artist community, some of the best restaurants and shopping in Baja. The popular Los Cerritos surfing beach is only a few minutes away. More shopping, services and surfing in El Pescadero, a short drive. Our Rancho Nuevo beach is unspoiled and receives far less use than the beaches closer to town (we still have nesting sea turtles!). Hammocks, outdoor furniture, beach chairs, towels, ice chests, BBQ, outdoor shower, it's all here. Bed and breakfast and cooking classes available seasonably. We have been traveling in Mexico since 1974 , 17 years ago we began looking at properties both on the mainland and in Baja Sur. This property far surpassed anything else we found. Ocean , mountains, sunrises and stunning sunsets. It is livable year round and June and July are some of our favorite months. This property provides us with privacy, security and complete peace& quiet while we are on it. The beach is walkable for a good 2 hours and connects with the biggest surfing beach in the area. Nearby Todos Santos provides a great nightlife, and many cultural events without the commercial feel of Cabo. There is an assortment of terrific restaurants, galleries and the ability to purchase organic fruits and vegetables, fresh fish and free range chickens. I teach cooking classes so good products are important to me. We are well traveled and continue to return to our home in Mexico, feeling like we really hit the jackpot. Nearby Sierra La Laguna Mountains to east. Trails, hiking, biking, driving. Parking is on gated secure property. Miles of beach to walk on. Secure parking in gated property and neighborhood. Fully stocked kitchen, with everything including spices, and filtered drinking water. A cooks kitchen. There are 6 options for dining, both inside and out. There is a large video library. Boogie boards, beach umbrellas and chairs. The library is extensive with a large assortment of reading material and books. Palapa, 15'X 21', paved floor. fully furnished with hammocks, couch, bed, chairs and dining area. Large (5X7 meter) shaded palapa area on property; additional outdoor shower next to beach. Perfect spot for peaceful rejuvenation. Lovely spot with owners Rory and George making our stay so easy. Beautiful location with the rooftop sitting prime spot for morning coffee and whale watching all day. Safe, clean, comfortable and on the beach with all needed amenities. Swimming beaches are nearby. Great to be out of tourist area and come to learn of sweet communities of Pescadero and Los Todos Santos. Rent car directly from Mex or Hertz or Avis not on Expedia or other internet. In closing, this beautiful spot is a haven for rest and peace. Thank you for your kind comments. We so enjoyed your good company. We had the good luck to stay at Rory and George’s beautiful Casa Paloma in April 2017. They have a beautiful property overlooking the ocean and both the house and the casita are lovely. Rory has great style and there are thoughtful, beautiful and quirky little touches throughout both the houses that you keep discovering as you are there. I understand that George has planted most of the plants in the garden himself and it is fantastic with terrific gravel pathways throughout to keep the sand down. The beds are super comfy with lovely linens and the kitchens are well appointed. We really appreciated being able to use their beach chairs, umbrellas and coolers for our beach adventures. The views from both the house and the casita are great. Although Rory and George were not there when we were there they were most helpful and supportive from a distance and while we were making our travel arrangements. You can’t go wrong staying at this lovely hacienda on the beach for your vacation! Highly recommended! Fantastic and awesome doesn't begin to describe our week's stay at the Casa Paloma casita! The accommodations were super comfortable, clean and beautiful. We couldn't take our eyes off the ocean as we watched whale after whale go by as well as manta rays playing in the surf. We enjoyed walking and beachcombing and had the beach to ourselves. We were fortunate to enjoy the owners since they were there at the same time. They gave us lots of tips to great restaurants in Todo Santos and Pescadaro and places to shop for just about anything. Casa Paloma is far enough away from any town so it is very quiet yet it is close enough to Todo Santos and La Paz that it's an easy drive. The drive from the airport in San Jose del Cabo is on excellent roads took less than 1.5 hours. We will return to Casa Paloma as soon as possible. Thanks Rory and George for a wonderful vacation. Thanks for the pleasure of your company! So happy you just booked again for next year, looking forward to another great week. I was a superb whale week. Wow, what a great property! Almost didn’t write this review because we wanted to keep this house as our own personal secret. This was our second time staying at Casa Paloma. If you are looking for a place to unwind and unplug this is the location for you (though they did just get Wi-Fi). Having morning coffee watching the whales (some as close as 50 yards off shore) and if you’re lucky, you will see baby manta-rays jumping out of the water too. We enjoyed clear blue skies, beautiful sunsets and starry nights. The property is a well maintained, beautiful desert garden. There is easy access to the beach for wonderful walks, yoga or meditation. The owners Rory and George were the icing on the cake; with suggestions on best route and sightseeing recommendations. Ceritos Beach is a short drive if you want to surf or swim. The nearby town of Todos Santos is a wonderful little surf and artist community that harkens you back to sleepy old Mexico. The people are friendly and the food is some of the best we have ever had; especially Hierbabuena, with organic herbs and vegetables grown on site. This location is the perfect spot for someone who appreciates nature and exquisite beauty in a remote, non-touristy setting. Highly recommended! You were the icing on our cake that week. We so enjoyed your good company and look forward to seeing you again this June. Thanks for the kind words and for renting the casita. We just arrived home from a 5 night stay at Casa Paloma and are already looking forward to a return visit. We stayed in the Casita, a charming little cottage in a beautiful garden setting. The rooftop terrace affords a fantastic view of the ocean and nearby mountains. It is a tranquil location where you can walk for miles on the deserted beach and gaze up at the stars at night. The nearby town of Todos Santos is delightful with many excellent restaurants and shops with quality merchandise for sale. We highly recommend this vacation destination. We are grateful to the owners of Casa Paloma for creating such a superb Baja Sur, Mexico experience. It far exceeded all of our expectations! 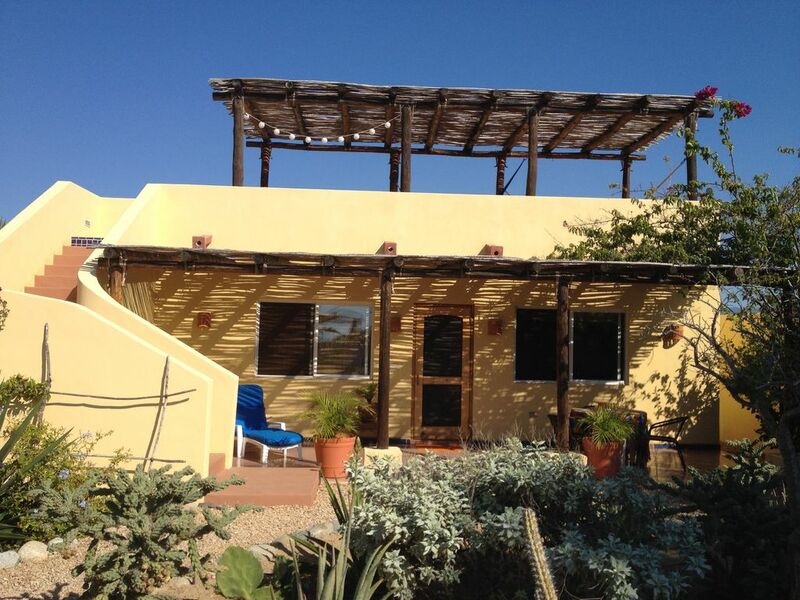 We had a wonderful stay at the beautiful Casita at Casa Paloma. The pictures on the website didn’t do it justice. We loved the glorious desert gardens and the breathtaking 360 degree ocean/mountain views from the roof top terrace. It was exciting having our morning coffee as we watched the whales play in the distance. If you’re lucky enough to have owners George and Rory on the property they will give you priceless tips for off the beaten path day trips and fabulous places to eat; from roadside fish taco stands to fine dining. We loved the casual, laid-back feeling of the beautiful and self-sustaining Rancho Nuevo, Baja Sur oasis. It is suggested that renters check in to property before dark.